You can listen to a history of this location before the Powers Building (above) was built on the Democrat & Chronicle's RocRoots site. The Monroe County Library System details the construction history of the Powers Building. Special thanks to New York City developer Value Properties, Inc. for their successful renovation of this outstanding Rochester landmark, as detailed in the New York Times. 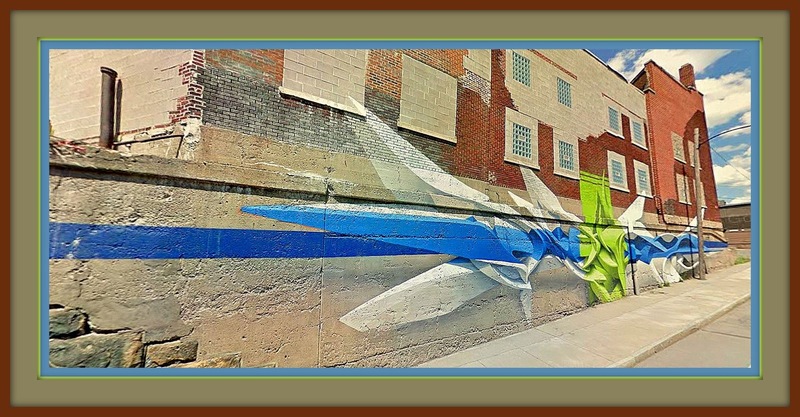 Before and after pictures of the renovation are featured on Rochestersubway.com. Hans Padelt's photos (Library of Congress) give a historic view of the interior. 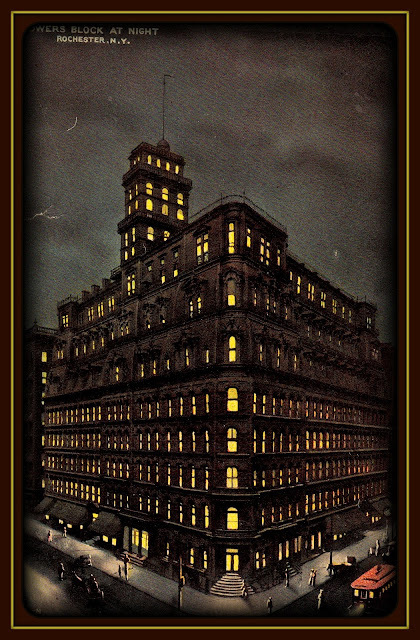 Google Street View usually does not include night images, so for those interested, the above is a postcard from the early 20th century which shows the Powers Building at night. No credits or publisher information was on the card. Click the image to enlarge. Dramatic facade above what was most likely the original front entrance to the building (Jan 2016). 3 Mansard roofs and a tower were added in attempt to make the building taller than surrounding structures (May 2012)..
"Saltshine" Covered with dried road salt, Rochester streets reflect the sunlight of a cold winter's day to illuminate the Ohio Sandstone from below (January 2016). In 1865, this was probably the original main entrance to Daniel Powers' bank (Jan 2016). 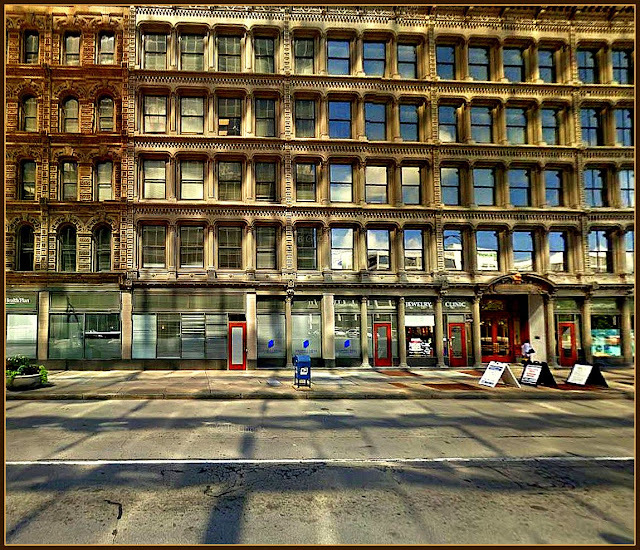 Another mood is created when the sun reflects off the glass walls of the building across State Street (November 2015). Bouncy, Bouncy! (January 2016) From the windows of the Powers Building the sun bounces off a Powers Building onto the glass surfaces next door, which illuminates the Powers Building, whose image then appears on the glass wall. The Powers Building is always fascinating for the photographer! Artistic Google accepted an enhanced version of this view for display as part of that fine Street View derivative Collection. "Land Yachts" wait for the light across from the Powers building in 1968. This rochestersubway.com photo shows that the Monroe County Savings Bank had moved into the Powers Building from its original home, now occupied by the First National Bank. The Powers Building at this stage was suffering from haphazard small renovations, none of them in keeping with the original character of the building.